Of course good old fashion healthy diet, fresh air, exercise, and plenty of sleep go a long way towards helping kids and their parents get the most of their days. Herbs can be used to help create that firm foundation and also offer a helping hand when a little extra support is in order. One of my favorite herbs for supporting students is the lovely and fragrant rosemary. In the language of flowers rosemary is for remembrance and indeed rosemary is used by herbalists to refresh a tired mind and help with memory. Enjoy 3 tea blends which offer the perfect way to welcome kiddos home after a long day of school at the beginning of the school year or any day! Brew up a pot tea and enjoy some special time together. For kiddos (and their parents) having a hard time getting the sleep they need this post is full of simple activities and ideas for providing herbal support to help everyone enjoy a good night’s sleep. Herbs and all the benefits they offer can be easily enjoyed by added them to your family’s day to day life. Teas, baths, first aid, and even food are great ways to incorporate herbs into the careful attention given to those we love. 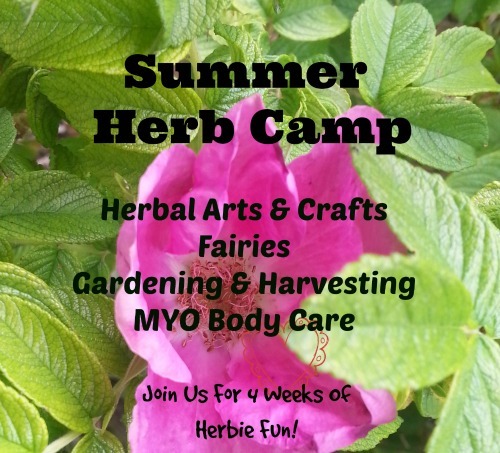 As the Family Educational Director at the Herbal Academy, I have the lucky task of sharing the usefulness of herbs for families with the Academy’s many readers. The family herb series of posts is chock full of plenty of information, recipes, useful tips, and children’s activities for enjoying some of the most popular and family friendly herbs around. Check them out below! Delicious and fragrant lemon balm is great for the whole family helping to ease viral illness, stomach upset, and restless fractious nerves that we all suffer from sometimes. Like our friend lemon balm, chamomile helps to ease stress and tension, stomach issues, and cold and flu discomfort. These happy yellow-orange flowers offer surprising benefits tucked within their lovely petals making it helpful for everyone in the family! More than just a tasty candy or toothpaste flavor, mint helps to soothe an upset tummy, supports the body in fighting infections, and even helps to calm and refresh the nervous system. Did you know that rose is used by herbalists as a wonderful herbal remedy? Learn how rose can help your family too! Wonderfully calming and delightfully tasty, linden is a great friend for everyone in the family! Gentle and beautiful, violets offer nourish food while also helping to ease coughs, digestive issues, and fevers with it’s cooling demulcent properties. Beloved by herbalists, nettle is perhaps one of the most treasured herbs. As the saying goes “when in doubt, use nettles”! This common weed is actually a very useful plant. Learn about the amazing uses of this lovely little plant. Perhaps one of the most popular applications of herbs is for helping to support the health of the immune system. And what parent or teacher hasn't wished for a little extra help in this regard during the school year? Visit the posts shared below for some simple tips and recipes to use with your family! Elderberry syrup is well-known nowadays among many of us. This recipe is exceedingly delicious and full of not only elderberries but also rose hips, hawthorn berries, ginger, cinnamon, and more. Whip up a batch to have on hand! If you are looking for other syrup options, this grape syrup is filled with the antioxidant goodness of grapes and enriched with herbs of your choice, this syrup recipe offer the perfect alternative to elderberry syrup. If you have a stove, a big pot, and some herbs on hand then you can make this super easy humidifier! Use this method to add a bit of aromatic moisture to your home during the dry winter months and also to help clean the air during illness. I hope you have found lots of resources to support your family during this exciting time of year. Best wishes for a beautiful year of learning and fun! Do you have any tips and tricks for supporting your family's health at the beginning of the school year? Share with us below in the comment section! Please note: This post contains affiliate links. Visit my affiliate page to learn more and thank you for your support!